Let’s talk a little about putting. All top professionals stress how great putting is necessary to win tournaments. Whether a major championship is on the line or a two dollar bet among friends, it all comes down to making putts. As a teaching professional, people ask me all the time, “how can I lower my handicap?” The answer is simple. Make more putts. It might not be the answer they want to hear, but it is the truth. I think 30 putts or less per round is an achievable goal for everyone. I have been through thousands of putting thoughts and very few have stood the test of time. I am always trying to simplify the game. If your putts are not dropping, try these simple thoughts. 1. Stick to your putting routine. (if you do not have one, we need to talk). 2. Always visaulize the ball dropping into the hole. 3. Have a small forward press to start the stroke. 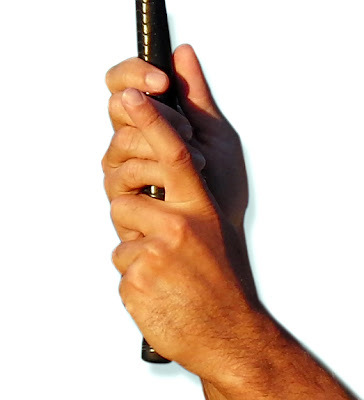 In the completed grip, the left index rests over knuckles of the right hand. 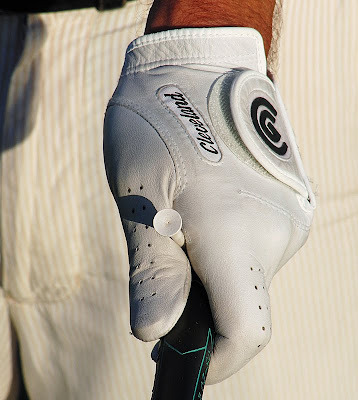 This grip minimizes any breakdown of the wrists. In the last post, we talked about a couple of things that separate a low handicapper from a high handicapper. We dis­cussed “positive” swing thoughts, and selecting a “swing key” during warm‑ups. This will help immensley when you hit a poor shot and help you react to it. From observing golfers at all levels, it seems that balance is a key element that separates the low handicap player from the vast majority of golfers. Good balance keeps the club and the weight shift moving in the same direction and in the right sequence. Balance also encourages good technique. Many swing flaws send the body into positions in which it is impossible to maintain balance and decrease the chances of solid contact between the club and the ball at impact. 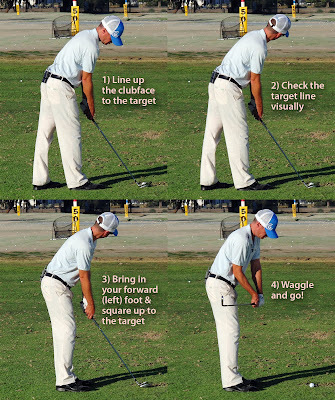 Next time you are on the golf course, think about finishing each swing by holding the follow through for a few seconds. You will soon start to feel the correlation between good bal­ance and solid contact. The Golf swing is a chain reaction of events. For more consistently good play, try to keep in mind a systematic method for setting up to each shot that includes all of these factors. 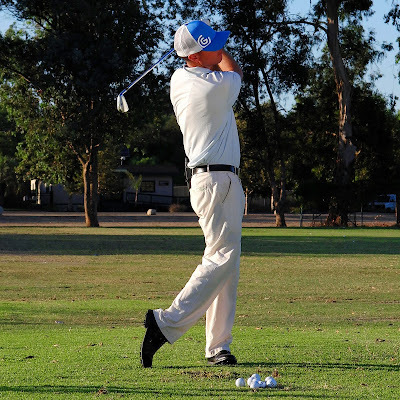 Bobby Hinds is a Teaching Professional at Woodley Lakes Golf Course with over 10 years of teaching experience. In each issue of the Wedge, he will ,share with us some helpful thoughts and tips to help lower your index and make the game more enjoyable. He is available for lessons through the Pro Shop. For more information, go to BobbyHinds.com. All golfers know that playing this game is often a struggle. Sometimes the challenges are external circumstances be­yond our control, while other times we seem to get in our own way. After twenty years of playing golf, I know what it feels like when your game has deserted you. In every round of golf we face some sort of adversity that tests our will. What separates low handicap golfers from high handicappers is how one reacts when the poor shots appear. It is a golfer’s greatest temptation to “fix” his or her swing on the course, but when we start fixing our swings we fill our heads with swing thoughts and lose our sense of feel. The golf course is not the place for any sort of experimenting. The average golfer accumulates so many swing thoughts throughout a round that good play becomes nearly impossible. I’ve come up with a few “emergency thoughts” that help me get my game back on track while on the golf course. These positive swing thoughts will prevent poor play or turn things around as soon as possible when your game is in trouble, adding to your enjoyment on the golf course and lowering your score. Before beginning a round of golf, select a swing thought for the day. The best place for thinking of a swing key is at the driving range during warm up. 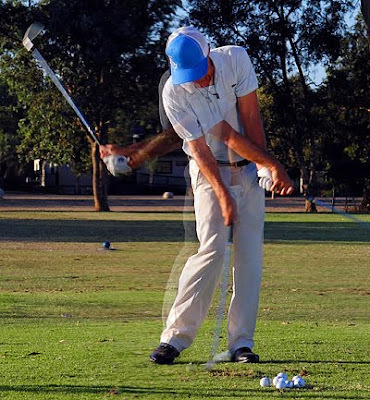 The most effective swing keys are simple and not specific to any part of the body. When golfers resort to manipulating certain parts of the body in hope of finding that ‘perfect move’, they can easily start over thinking. 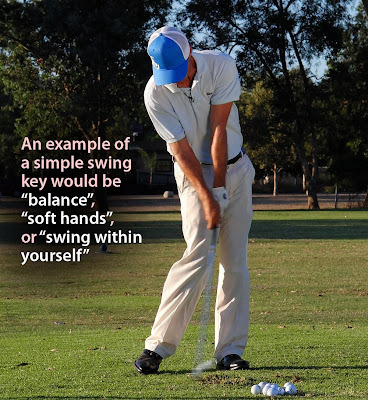 An example of a simple swing key would be “balance”, “soft hands”, or “swing within yourself” After committing to a single swing key, do not change to other swing keys. Proper preparation for a round of golf should include these positive, non‑technical thoughts. A player’s warm‑up session serves as a time to stretch the body and focus your mind. When you plan a day of golf, show up early enough to hit a small bucket and get all the experimenting out of your system. Free your mind from all the needless tinkering and play golf, not golf swing. 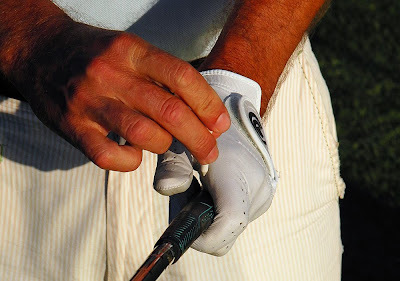 In the next post, we’ll discuss “balance”, “soft hands”, and the importance of the “pre‑shot routine”. Bobby Hinds is a teaching pro at Woodley Lakes Golf Course and has over 10 years of teaching experience. In each post, he will share with us some helpful thoughts and tips to help lower that index and make your game more enjoyable. 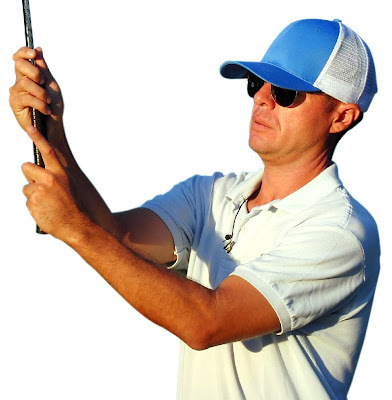 To schedule a lesson, or for more swing advice, email Bobby at BobbyHinds@aol.com.